At Adam Pool and Spa we specialize in all things pool repair, installation, and maintenance related. But sometimes we like to stress the importance of other components that compliment your pool. More importantly we thought we would take a little time to talk about how an outdoor kitchen our pool side kitchen can add loads of value to your pool. We can help install the most amazing pool you will find in the western Chicago suburbs. We do recommend that you add additional outdoor living components to enhance your pool experience. A Poolside outdoor kitchen can help create an amazing experience for your family to be apart of. 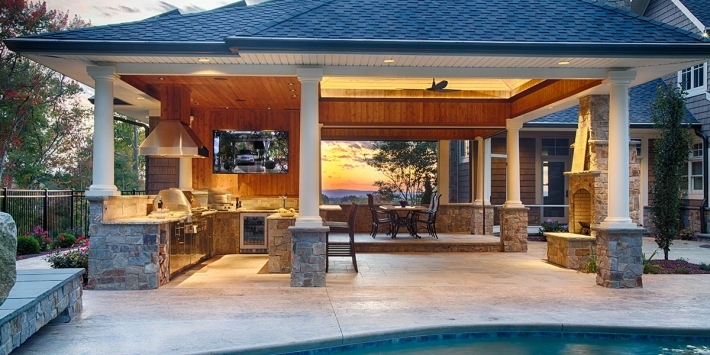 The outdoor kitchen can maximize the amount of time you spend outside next to your pool. Picture this, after a long day of swimming you the owner of the pool do not want to have to go inside to cook dinner while leaving your children unattended in the pool. The outdoor kitchen can also be a great entertainment piece for summer holiday parties. Adam Pools and Spas provides the best swimming pool design and installation for the Western Chicago Suburbs like Naperville IL. We come highly recommended for installation and for pool design. If you are interested in adding additional value to your pool and outdoor living space, then let us know. As we are designing your pool layout and traffic we will consider where an outdoor kitchen will fit best. We know what it takes to make your pool a success. We also know how to plan out your backyard to maximize your layout for the pool and other any other potential amenities you plan to add. We will also recommend you to other companies that can help with these amenities like fence, concrete, kitchen remodel, and sod. Regarding your Naperville kitchen remodel we recommend Q’s Cabinet Shoppe in Naperville. Give us a call for the Pool and Spa of your dreams. Or call us if you are looking for maintenance as well! Naperville Web Design by Naperville Web Design © 2012–2019. All Rights Reserved — Powered by Naperville Web Design.